This December CEUBIOM Project developed additional page at the ‘European Biomass Datasets’ Working Area entirely dedicated to Ukraine. It included links to three useful regional map-based resources of 2007-2010 i.e. 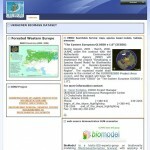 EEBIO and BINU searchable web-systems with IFS-pages as well as links to BioModel’s web-page GLM-scenarios by 2050. BioModel’s note: read ‘forested Eastern Europe’ instead of ‘forested Western Europe’ at the title (picture).